Looking for an action-packed shooter with a war theme? Why not play Endless War 3? 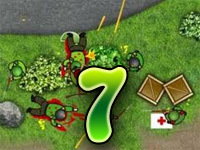 It is a great flash game in the shooter genre with a little bit of a puzzle twist to it because you will have to come up with a good strategy to beat some of the levels. So, are you in for a challenge? The creators of Endless War 3 have divided the game into four campaigns: the usual Iraq War, the WW2 in the Pacific Ocean, WW3 Humans and WW3 Mutants. These campaigns aren’t there just to make the game look as if it has a lot of content, but they also represent difficulties. You best start with the Iraq War as this is the easiest of the four. As you progress through the levels you will unlock new ones, get more weapons, get new enemies and uncover harder challenges. The game is rather straight forwards with the mission objectives and there isn’t much of a story going on, nor will you feel any sympathy for you character. However, with all of the shooting happening in the game and the tactical thinking that runs through one’s mind, there is hardly any room left for a satisfying story! You will find it that the gameplay is rather simple and quite common which is not necessarily a bad thing. You control your character with the W, A, S and D keys like in any shooter and move the camera with your mouse. To fire your gun you must hold the left mouse button. You secondary fire is done with the SPACE key and you can reload with the R key on your keyboard. These controls are, however, user-programmable and you can change them from the controls menu. Aside from this you can use the numbers one through four to change between your weapons. As far as the weapons are concerned you can choose which ones you will be using at the start of the mission and you can toggle between different rifles, pistols and grenades! There is a small cheat as well, when you play Endless War 3 you can select to automatically unlock all weapons in the options menu, which will make things a bit easier. The missions are quite simple in their core, but finishing them will prove to be a very difficult task from time to time. 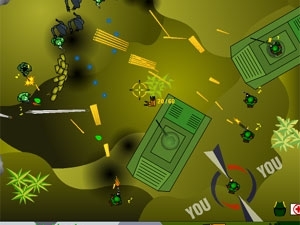 You will have to go through trenches, mountain terrain, wreckage and destroyed cities in order to eliminate your opponents and get to the marked area. 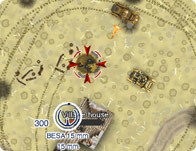 Your task will be difficult if you are outnumbered and if the enemy uses obstacles to hide themselves and you can be sure that this will happen a lot. Fortunately, you might get a team of soldiers under your command that you can control every now and then. They can provide with cover fire and walks beside you so that they take all the damage while you focus on killing the rest of the enemy. All in all I certainly recommend that you play Endless War 3 and will not spoil the game for you any further!